Richard Lovelace. Princess Löysa drawing. Ah this is true Divinity ! I will un-God that Toye cri'd she ? He finds now a new Instrument. Halfe in his armes, halfe in the flood. Hangs no where now, but on her neck. Contemnes, Thunder and evill Fame. Which first he could not understand. Sencelesse and colde, then he before. Weake execution of thy bow. To that part whence we have our wound. Beauties, than they destroy'd before. The Judgment of Paris. 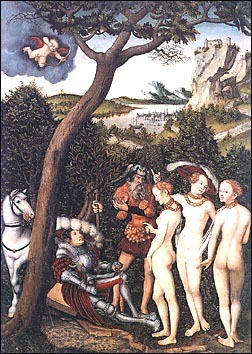 c.1528. London: Unit Library, Ltd., 1904. 26-27. Created by Anniina Jokinen on April 26, 2001.